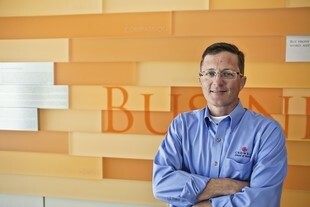 Dave Bourgeois is Biola’s new go-to expert on integrating technology and teaching. His new role as director of innovation in the Crowell School of Business stems from his passion to incorporate the latest digital tools and resources into the classroom, business and ministry. As an early proponent of online education and an advocate for using technology for the success of a student and a ministry, Bourgeois found a gap in how technology and ministry were being discussed. Books on the topic explained how to use the technology, but failed to show research on why to use it or how best to use it. This realization resulted in his first book, publishing this month, “Ministry in the Digital Age.” He also took over the biola.digital conference last year, formerly known as GodBlogCon, expanding the reach and breadth of the conference content and purpose. Bourgeois took a few minutes out of his busy schedule to talk about his latest projects and explain what his new title “director of innovation” really means. In layman's terms, what does your new title mean for students and faculty members? Understanding digital technologies is a priority for our students and faculty. I am working with business faculty to ensure that every student who graduates from the Crowell School of Business is fully prepared to engage the business community and the world through the use of the latest technologies and innovations. One of the primary ways we are doing this is through the integration of technology experiences into the classroom. For example, in our business communications class, students are now required to do a presentation via WebEx, a web-based communications tool similar to Skype that is a standard tool in many organizations around the world. In my E-Business class, we partner with an e-commerce provider to have students develop working online stores for real clients. Students are also required to study the impact that these technologies are having on their personal lives. By providing students with these experiences during their time in our degree program, they will be well-prepared to use these tools after they graduate. On the faculty side, my role is to ensure that every faculty member who teaches in the Crowell School of Business is aware of and able to use the technologies and innovations that will allow them to engage their students. By meeting with each faculty member in the school personally, I have begun to understand just where they are in their use of technology and help them move forward in a way that meets their own personality. I have brought in others from around campus to demonstrate some of the newest and best technologies and practices so that we can learn from them. Additionally, I helped the Crowell School of Business start a faculty blog — “Business.Ministry.Life.” — last year. You've spearheaded some of the movement towards pushing technology in the classroom. What is the value that you see in that and has it been successful? There is no “one size fits all” solution in the classroom. In some cases, we can take a class totally online. In other cases, a mix of technology solutions makes more sense, with some time in the classroom and some time online. The key is to understand what will create the best learning environment for the student in each course and then apply technology appropriately. We must constantly evaluate our results and improve. We have found that most students are very happy with the use of technology, when it is done correctly. Technology can bring quite a bit of value to the classroom. First, it can give students new ways to learn. For example, allowing a student to watch a recording of a lecture online gives them the ability to stop it and watch a section of it again if they are confused. Online discussion boards give every student an equal voice; students who would never raise their hands in class suddenly become quite articulate in an online post. In these and other ways, this technology integration has been quite successful. The biola.digital conference has gone through some changes in the past few years. What are you excited about for this year? The biola.digital conference has always had one goal: to empower Christians in the use of social media and other digital technologies. Even from its early days as the GodBlogCon, it sought to bring together forward-thinking Christians who wanted to work together to use these tools to love God and love our neighbors. I believe that this year's lineup at biola.digital is the best we have ever had. Our keynote speaker is Michael Hyatt, the former CEO of Thomas Nelson and bestselling author. Michael has hundreds of thousands of followers on social media and a keen understanding of proven strategies for using these tools well. Besides Michael Hyatt, our other speakers will be presenting sessions that directly relate to the use of social media and digital technologies for ministries, churches and educators. We have speakers from several different universities and ministry organizations sharing their research and insights. You can see the full lineup and other details on the conference website. Your new book required quite a bit of research. How do you hope this research will change the way ministries interact digitally? When I finished my doctorate in 2006, I began a journey to understand how churches and ministries used technology from a research point of view. Many books, seminars and consultants had created a lot of material on how to make a website, blog or podcast, but no one had done much real research on the topic. I spent the next several years researching the use of these technologies by churches and ministries. It was during this time, as I began consulting, speaking and teaching in this area, that the idea formed for a book that encompassed this work. This idea became reality as Ministry in the Digital Age was published just this last week by InterVarsity Press. My hope for this research is that ministries can leverage the use of digital technologies to improve their effectiveness. Historically, Christians have been at the forefront of technology use. My hope is that we can once again reclaim that distinction. Readers can find more information about my book on my website. Lastly, how does your new title reflect your passions regarding ministry in the digital age? The title “Director of Innovation” may seem a little pretentious, I suppose. The title wasn’t my idea, but now that I have it, it inspires me to constantly push the boundaries. Not just with technology, but in many areas of education and ministry. I am passionate about technology and I am passionate about my faith. With this new role, I get to combine the two. What could be better? Search Biola's experts directory and get to know other faculty. For more information, contact Jenna Bartlo, Media Relations Coordinator, at 562.777.4061 or jenna.l.bartlo@biola.edu.